Las Vegas, NV, (Oct. 20, 2018) - Sometimes things in life are simply quick and painless. Most of the fights at FFC 32 however, were actually quick and painful. Knockouts, let's be honest, usually are quite painful. Friday night's Main Event was one of the only fights at FFC 32 (which was an all-MMA event) that did not end in a knockout. 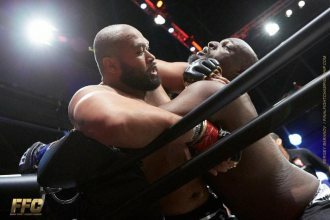 Shelton "Gravedigger" Graves (9-3-0) defeated Carl "Badwater" Seumanutafa (11-9-0) by unanimous decision (49-46, 49-46, 49-46) to win the vacant FFC MMA Heavyweight Championship Title. Graves did a great job of avoiding standing toe-to-toe with the knockout artist, Seumanutafa, spending most of the fight pressing the heavy-handed Samoan (Seumanutafa) up against the ropes and using knees to the body and a series of quick uppercuts to frustrate his opponent. The strategy worked, as Seumanutafa was frustrated with the constant pressure, which allowed Graves to keep him on the ropes and against the turnbuckle, taking away any opportunity for a Seumanutafa trademark knockout. In the Co-Main Event, Undefeated Welterweight, Austin "AK-47" Vanderford (6-0-0), kept his unblemished record in tact when he rocked Emilson "The Amazonian Warrior" Freitas (7-3-0) with a nice left hand to the temple at the 1:38 mark of round one. Vanderford wins by KO for only the second time in his professional career. Previously unbeaten Light Heavyweight, Ivan Erslan (6-1-0), was trying to stay undefeated as a professional but his opponent, Branko Busick (3-1-0) had other ideas. Busick sent Erslan to the canvas at the 4:41 mark of the second round with a solid left hand to the chin and it was all she wrote for Erslan. Busick picks up the first KO victory of his young career. In the Lightweight division, as promised, it was a "grapplers paradise" for as long as it lasted... And it didn't last very long. Brandon "Kiba" Ricetti (9-2-0) submitted Adam "Smash" Smith (11-10-0) by Arm Triangle at the 4:26 mark of the very first round. If you're keeping score, all nine of Ricetti's wins have come by submission. FFC 32 took place at its permanent home, "Fight Dome", which is located at Caesars Entertainment's Rio Las Vegas. The event aired nationwide on CBS Sports Network.